Internationnal customers price is € 232.50. Compact in size but big in sound, the PR 781 is a dynamic microphone that can be used in a variety of recording, live sound and broadcast or podcast situations. 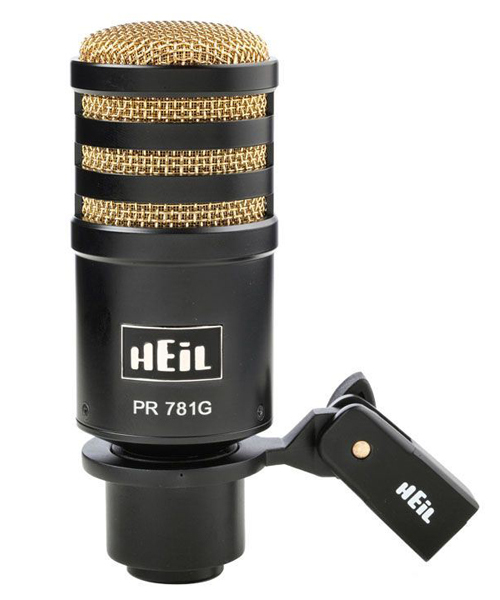 The PR 781 offers a wide frequency response while maintaining the Heil Sound characteristics of excellent detail reproduction, vocal articulation and rear rejection. The PR 781 comes in black or black with gold mesh that will look great in any environment. The available shock mounts are PRSM and SM-2 shock mounts for broadcast or podcast applications. Product: PR781 Generating Element: Heil PR Dynamic Frequency Response: 50 Hz to 16,000 Hz Impedance: Balanced 600 Ohms Out, 3 pin Polar Pattern: Cardioid Output Level: -55 dB Diaphragm: Low-mass aluminum Finish: Black Satin Epoxy Net Weight: 14 oz.